Today i had a simple breakfast. Actually this is my breakfast on most of the days because I wake up just enough time to get ready and go to work. Not enough time to go eat big breakfast. Every night before sleep, I will plan to wake up early on the next day morning but in the morning I will convince myself that sleep is more important than breakfast. So, about my breakfast today, I had 2 slices of bread with peanut butter and grape jam, 1 cup of 3 in 1 vico soy protein and my detox water. 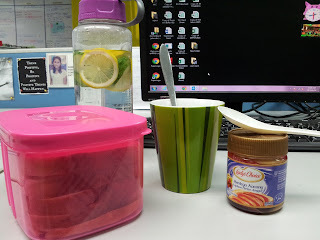 For past two days, I am hardworking enough to prepare and bring my detox water. I just put few slices of lemon and cucumber and add water. Thats it. One thing I noticed, I drink more water when I drink my detox water. Well, it is good what to drink more water. Have a good day peeps! !